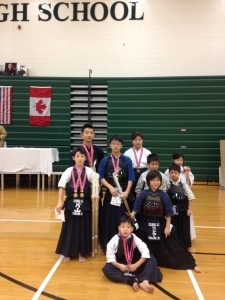 Last Sunday,February 1５,1７th　Detroit　Kendo Tournament was held in Detroit . About 2０0 kenshi came from not only the suburban city but also Chicago and New York. 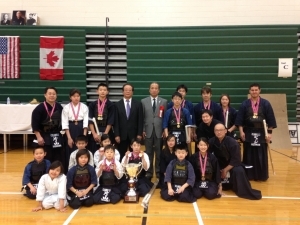 From the Columbus Junior Kendo Club, １５ kids and ７adults participated in individual and group matches and did their best. Kentucky Kendo Tournament held on March 14th. Those who would like to participate should fill in and turn in the application forms to Katayama-sensei by Friday, February 27. In Kendo, the distance between yourself and your opponent is called ma-a-i. This term is frequently used, as in the phrases such as "narrowing the ma-a-i" and "ma-a-i is too close." When the ma-a-i is too far, your shinai will not reach your opponent even if you step forward. When the ma-a-i is too close, you can be hit by the opponent. The basic of ma-a-i is "issoku ittou no ma-a-i (ma-a-i of one-step, one-strike)," which means the distance in which your shinai will reach your opponent just when you take one step forward. The actual distance of "issoku-ittou no ma-a-i" can vary, depending on how big your body is, how much you can jump, etc. Confirm your own appropriate "issoku issou no ma-ai," by trying a variety of distance during the practice. Through such practice, you will become able to master the sense of taking appropriate distance, and to make good moves during the Kendo matches.